HOW SPOOOOOKY WILL YOUR PUMPKIN BE? 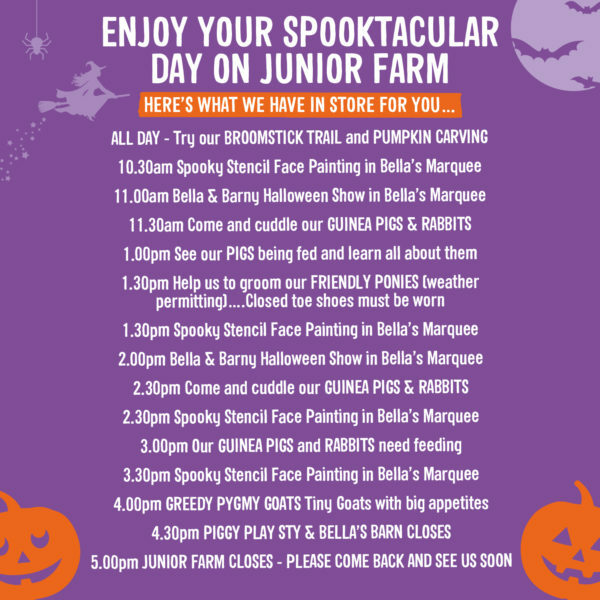 Come and hang out with us at Junior Farm this half-term! There’s HALLOWEEN FUN to be had for all your little ghosties and witches so why not come dressed to impress in fancy dress to “get into the spirit”. Pay once and play all day – come and go as you please – including indoor soft play and pumpkin carving too. NEW – Don’t miss the twice-daily Halloween shows with Bella and Barny – our popular farm mascots – to entertain the children who’ll love the singing and dancing and be sure to follow the Broomstick Trail too where there’s a little treat in store when they complete it. 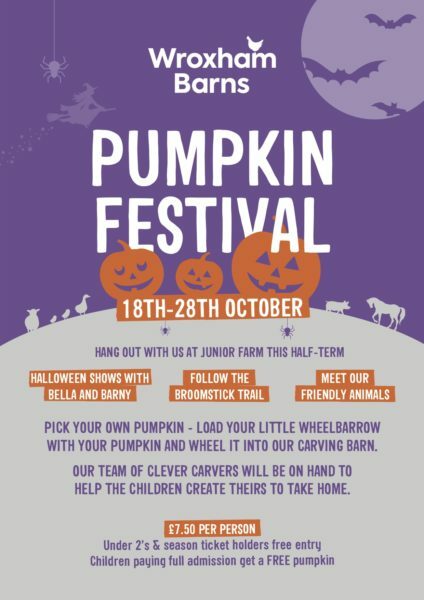 Join our Great Pumpkin Caper as the children grab one of our little wheelbarrows and head to the pumpkin station with pumpkins aplenty ready to pop in the barrow and wheel to the big spooooky Halloween barn – look out for those witches flying, spiders hanging and bats flying! Then it’s time to get creative. Our team of clever carvers will be on hand to help the children create theirs to take home. Admission is £7.50 per person (under 2’s and Season Ticket holders get free entry, additional £1 pumpkin fee). Full paying children (aged under 16) get a FREE pumpkin. Additional pumpkins £1 subject to availability.